Know about the relative response factor and its calculation in system suitability parameters in HPLC analysis of pharmaceutical substances and pharmaceutical products. During the manufacturing process of active pharmaceutical ingredients, some unwanted substances are produced those are known as impurities. Some impurities are raised due to the degradation of the actual drug. Impurities in pharmaceutical drug substances and drug products are required to be analyzed for the quantity of the impurities. To determine the actual quantity of the impurity it is required to have impurity standard. In the absence of the impurity standard relative response factor (RRF) may be used to calculate the actual quantity of the impurity. Q3B R2 of ICH Guidelines also says that if the response factor is determined correctly, it can be used to measure the actual amount of impurity. Identification threshold, quantification threshold and reporting threshold are given by ICH and it is important to determine the impurities within these thresholds. Relative Response Factor (full form of RRF) is an alternate method for the determination of the quantity of the impurities present in pharmaceutical products and amount of the impurity can be calculated with the help of peak area of the components. Relative response factor is the ratio of the response of the impurity and the active pharmaceutical ingredient (API) under the identical chromatographic conditions (chromatographic column, temperature, mobile phase, flow rate etc). RF in chromatography for different products are different and should be determined for individual substance. Relative response factor determined on a particular detector cannot be used in the calculation of product determined on another detector because different detectors show the difference in the response of the same compound. 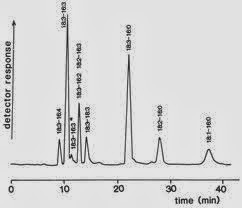 Solutions of at least three different concentrations of standard and impurity are prepared and injected in HPLC. The slop of area and concentration of impurity and standard are calculated to determine the relative response factor.